A close friend of mine once compared reading good short stories to eating potato chips; you start with the best intention of eating a few delicious, salty, crunchy chips, and end up staring regretfully into an empty bag. Which is not to say that I think of short stories as the junk food of the literary world, but rather as perfect, deliciously decadent little mouthfuls of prose. 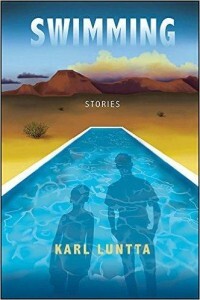 I finished Karl Luntta’s collection of short stories, titled Swimming, with that precise sensation of having enjoyed something immensely, and at the same time guiltily wishing for more. Luntta’s prose is refreshingly accessible and conversational, and the stories are just quirky enough to draw the reader in without creating distance between the experience of the characters and that of the reader. These are intimate stories, with an authenticity reminiscent of tales told at a family gatherings and passed from one generation to the next. Proverbs are ephemeral by nature, as are virgins. You can only be disappointed in them eventually. Although the stories bounce from Africa to the Americas and back, with some characters appearing in more than one narrative, Luntta manages to hold a thread of continuity and familiarity throughout. These are stories about personal victories and everyday tragedies, of relationships that span gender and age as easily as the stories themselves transverse the globe. In each story, the author has captured the small moments in life that move us toward each other—when things click into place, the right words are shared, an event is witnessed, and a deeply human connection is forged. The title story, “Swimming,” is a natural pivot point for the rest of the work, painting a vivid, improbable, desperate, and eventually joyous tale about Maag, a terminally ill cancer patient who chooses to build a swimming pool in a rural African village, despite the blinding heat and logistical challenges. Maag reluctantly befriends Meshach, a local boy who is injured while helping Maag dig the hole for the pool. Maag’s illness, Meshach’s injuries, the completion of the pool, Maag’s first (and last) cool plunge into the water when the project is completed, and his final gift of the pool and property to Meshach—all embody the reassuring and poignant inevitability of life that is the essence of Luntta’s writing. Each of the remaining stories are, in their own way, about endurance and triumph: a father struggles to build a report with his estranged daughter; another father grapples with the fact that his wheelchair-bound son will never use the ice skates he purchased before the boy was born. In Swimming, Luntta, a seasoned travel writer and author of the novel Know it by Heart, has gathered a compelling collection of stories that presents an expansive inner view of the struggles that touch and shape lives. His writing has an ease of pace and a charming unfussiness that is extremely appealing, and which allows the reader that rare feeling of being present in the narrative. Whether sampling a story or two, or settling in to devour the entire collection, Luntta offers an often heartbreakingly intimate experience, well-tempered with humor and joy.